Trump Push For 'Energy Dominance' Boosts Drilling On Public Land The Trump administration is offering millions of acres of federal land for oil and gas drilling. It's a boon for some states, but is fueling battles with environmentalists. 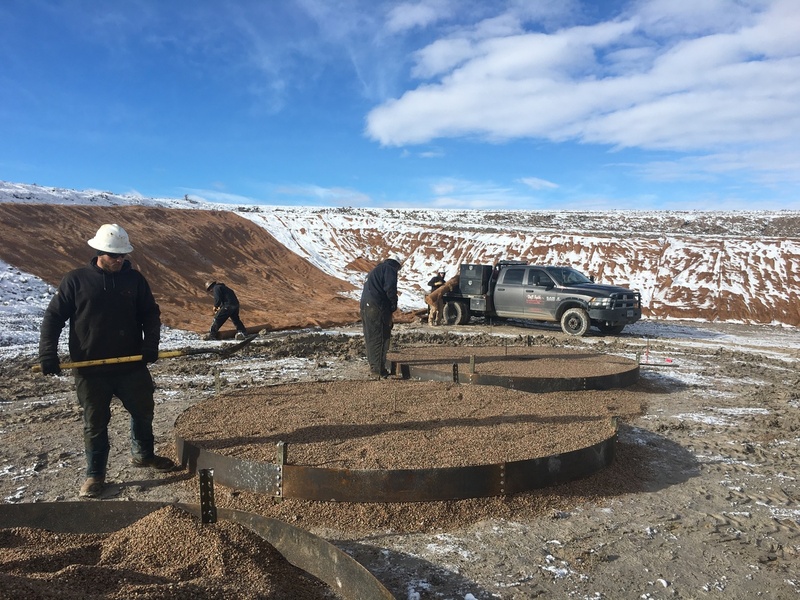 Workers at a Wold Energy Partners well pad in Wyoming place gravel where oil tanks will soon stand. A spike in drilling in the state is getting a boost from new lease sales on public land. "Our phone's been ringing off the hook as far as people that want a joint venture with us," Wold says. The wide-open land here is now filling up with trucks that kick up dirt on new roads. "I would call it a pre-boom, absolutely," says Wold. "We ought to call it recognition of economic exploration for Wyoming." Analysts say a perfect storm is making the country's largest coal state more favorable for oil and gas. Higher oil prices are certainly one factor, says Carl Larry, who advises oil and gas companies with the financial consulting firm Refinitiv in Houston. So is better technology for hydraulic fracturing, which allows wells to extract a lot more oil and gas than they used to from the same land. "It makes it more efficient, and I think that's where we're seeing the results on profitability," Larry says. Another reason is the vast expanse of cheap land in this state, much of it federally owned, and some of which is now being auctioned off for as little as $2 an acre. That's a fraction of some prices in Texas, Larry says, where more competition has driven up the cost of land. In Wyoming, "we're looking at places that aren't so crowded," he says. "It's untouched fields and that's what people are most interested in." The Trump administration has made much more of that cheap, public land available to oil and gas companies. The amount of land for lease has increased six times over since 2016. Federal agencies like the Bureau of Land Management (BLM) have also streamlined and shortened the leasing process. "I think that makes a big difference here, and you're making it easy. It's not like there's lot of red tape and documents and paperwork to sign," Wold says. Environmental groups say the expansion of oil and gas drilling on public land could harm habitat for pronghorn antelope and sage grouse. But the push to open up federal lands has been met with fierce resistance from environmental groups. Connie Wilbert, director of Sierra Club's Wyoming chapter, says the new leasing could undermine years of work to protect sage grouse, mule deer, and pronghorn antelope, all of which rely on Wyoming's vast, untouched lands for migration, breeding, and grazing. She pulls out a large map and points out new oil and gas leases directly in the state's mule deer migration corridor, the longest one in the world. "If these leases are all developed, or even a substantial portion of them are developed, it will devastate all of those wildlife values," Wilbert says. 37 percent of the remaining sage grouse population inhabits Wyoming, much of it public land. A recent study found oil and gas development has caused the bird to abandon its lek, or breeding grounds, causing further population declines. Over the past decade, the study confirmed population declines of up to 75 percent in the state. Mule deer and pronghorn also tend to flee from drilling or road sounds, causing indirect habitat loss. Other environmental groups have launched legal challenges to the push for drilling. One lawsuit opposed the Bureau of Land Management's shortened leasing process, and managed to nearly reverse it. There's also opposition to administration moves to shrink some national monuments to allow for more drilling and mining. The Trump administration says it is taking environmental concerns into account, and has delayed lease sales for some controversial areas in Wyoming and elsewhere. When BLM announced a shorter period for public comment and protests, it said monitoring and management plans by its local offices would help "adequately protect important resource values." The Interior Department did not return a request for comment. The Sierra Club's Wilbert worries the value of public land is being whittled away to just energy development. "I think it's really important to remember these are public lands," she says. "They belong to the people of the United States not just in Wyoming, but throughout the whole country." Around the country, the administration's drilling push has had mixed results. Last December, for example, the BLM offered all the land available for leasing in the National Petroleum Reserve in Alaska — 10.3 million acres. But drillers bid on less than 1 percent of the leases offered. In Wyoming, though, the surge of new oil and gas leases has been a boon. So far this year it's brought in more than $47 million, and more will flow to state coffers once the wells start producing. Nationally, BLM says it generated $360 million from oil and gas leases last year, an 86% increase from 2016. 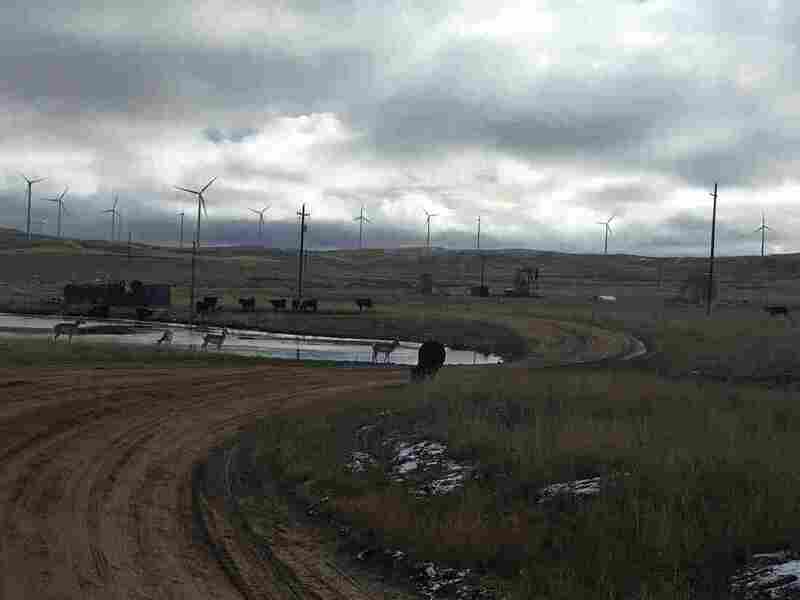 On his well-pad in Wyoming's Power River Basin, Peter Wold thinks industry can thrive here without hurting the environment. He points to a nearby meadow, where a herd of pronghorn antelope mix with cattle, wind turbines in the background. "We love this area, and the last thing in the world we want to do is mess it up," he says. Wold expects to start extracting oil and gas on this spot in February. That's the same month the BLM plans to auction off another 700,000 acres of Wyoming's public land.